Domestic violence is something that appears to be a taboo topic in Nigeria and I have seen my share of it as a child. In the scheme of things my experience looks inconsequential. My parents never hit at each other but there was enough tension in the house for us to know that the mental and emotional torture was just as palpable. I was only 5 when my father intent on walking away from a tense situation got into his car and as my uncle held my mother back, he revved out of the garage and unbeknownst to him, he drove over my mother’s shin – almost 42 years on, the event plays back in my mind like a slow-motion horror film. Elsewhere, I have seen worse, wives battered beyond recognition and nothing in the community, in society or in the law to actively come to their aid in support and in defence of their right to live in so-called matrimonial bliss. The preponderance of culture in a majority of cases has had the battered wife return to that atrocious environment as we sacrifice our mothers, sisters, daughters, aunts, nieces and womenfolk on the many bloody altars of tradition, religion, custom, beliefs or just plain male chauvinistic arrogance. The incredulity of it all lies in the many facets of the story, the preparations for a wedding without preparing for marriage, the acquiescence, silence or indifference of their community when the conflict started which culminated in murder, the lackadaisical attitude of the law to issues of domestic violence and the crown it all, a pathologist said the lady was stabbed 76 times whilst the father-in-law professes his son had 17 knife wounds to his view of the daughter having sustained just 3 stab wounds. We will not go into who is more qualified as a pathologist but we need to talk, we need to talk about Domestic Violence in our society and address the taboo issues head-on. Dr Cheluchi Onyemeukwe runs the Centre for Health Ethics Law and Development (CHELD) which is established to employ law, policy, ethics promotion and research, and practical health development projects to improve public health in Nigeria and other African countries. 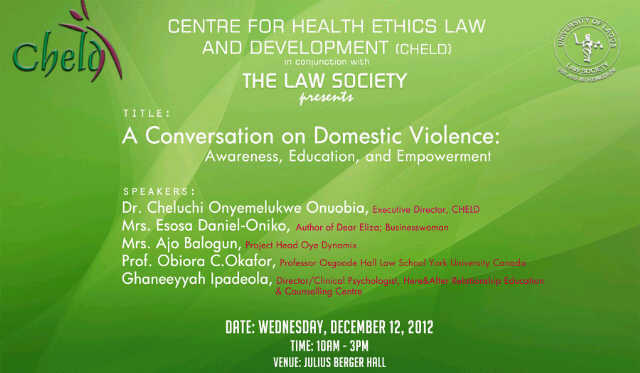 In conjunction with the Law Society of the University of Lagos, CHELD is presenting A Conversation on Domestic Violence – Awareness, Education and Empowerment. She says, “We discuss the signs of abuse, the myths around domestic violence, what to do in an abusive situation, the law on domestic violence such as the Lagos State law on domestic violence, the human rights aspects of domestic violence, the emotional underpinnings and impact of abuse. We emphasise that domestic violence is not only physical abuse but also emotional abuse. Then she says, “These Conversations are intended to do several things including but not limited to - keep the issue of domestic violence on the front burner and in the consciousness of different parts of society, provide information that is currently lacking, provide an avenue for people in abusive situations to seek help, and create avenues to break down cultural obstacles. I am quite in support of this event and the many initiatives that will keep the issue of Domestic Violence in the public eye until every similitude of it is eradicated and those who practice it face the full might of the law with prompt justice for the victims. There should be no excuse for Domestic Violence and it should never be excused by whatever belief system we may adhere to regardless of its provenance. I implore you to attend this event if you can, share the information with as many as you can and visit the websites for more information on this issue.